For that extra touch of luxury and convenience for both domestic and commercial environments, we can offer motorised printed roller blinds, using the internationally-acclaimed SOMFY system. 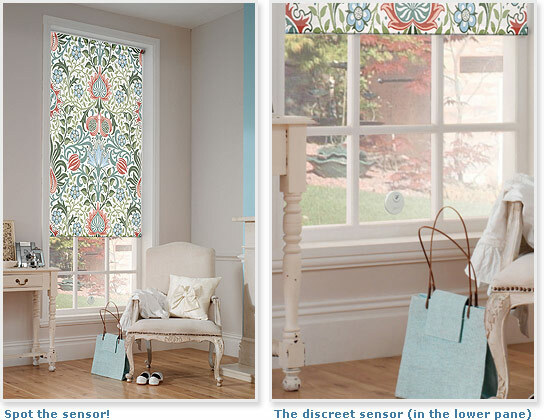 The blinds are available with two options – a wire-free, battery-operated system, including battery wand and remote control, and the Sonesse 30, which is a hard-wired system, which comes with remote control and the option of a light sensor, if required. The light sensor reacts to the ambient light, and allows the user to pre-set the system to suit the required environment, meaning you can automatically control the amount of light that comes in without having to leave your armchair! Sounds good, doesn’t it?